You are here: Home / Maintenance, Modifications and Repairs / Keyless RV Door Locks: Are They Worth It? 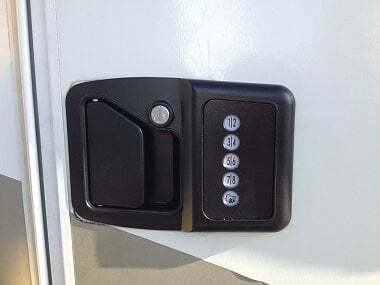 Keyless RV Door Locks: Are They Worth It? RVs are factory-made homes on wheels with door and cabinet locks that offer a false sense of security. That’s because professional thieves know that a limited number of keys open the majority of RVs. This is the result of RV lock manufacturers producing great quantities of the same keys and locks with little variation from RV to RV. Consequently the best thing you can do to protect your belongings is to ditch the factory default locks and install better aftermarket ones. 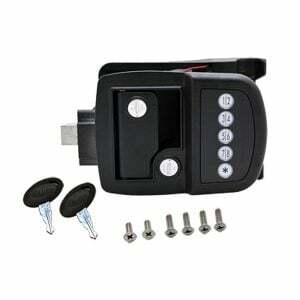 Keyless entry door locks are fairly easy to install with a minimal amount of tools and mechanical aptitude. Maintenance is also relatively simple. Some things you can do to keep your lock working well include regularly replacing the key fob batteries and cleaning all points of body frame, door, and lock contacts with cotton swabs and rubbing alcohol. Here are some well-rated keyless entry locks for RVs that you might want to consider. No wiring needed; uses 4 AA batteries (not included) It’s retrofitable in most RV entry doors and it’s easy to install Programmable with a 4 digit PIN number. The large buttons are easy to see and use Proximity sensing which illuminates the buttons. 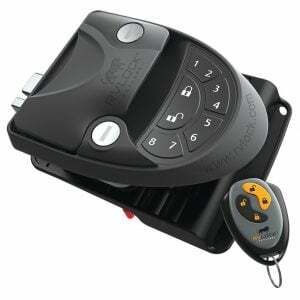 Self-contained electronic RV latch with Capacitive Touch Technology. Offers hassle free touch pad access: no key or fob to carry with you. An integral touch pad to the latch which controls the dead bolt. The key will always be able to operate the paddle or dead bolt lock in case of the user forgetting the code or having a dead battery, 8 inch x 5 inch x 4 inch. I too had one like the first picture which failed. Manufacturer sent me a replacement but I never trusted it, Always carried the key- so no point to it. We have two doors on our trailer and replaced both lock with the RVLv4.0. One would never allow us to change the PIN from the default 1234. After three short camping trips it quit working. Makes noise but does not lock or unlock. The second lock did not work at all. It acted as though the batteries were dead. I do not recommend the RVLv4.0. Total waste of money. We have had ours (RV Lock 4.0) for 7 months with minimal usage during the summer last year. Now we’re having nothing but trouble. Most of it stems from customer service. For two months we’ve been trying to get it fixed. Rather than sending us a new unit they send us one part at a time to see if that does the trick. Each time it requires us to go out to the storage lot, take it apart, put in the new part and test it. Oh and their first solution was to change out the batteries (like we hadn’t tried that already). Now they want us to take it all out, put our old handle back on (hope you kept yours! ), and ship it to them so they can determine the issue. OR tell us there’s nothing wrong with it and the problem is on our end. I cannot believe the lengths they’ll go to not send a new unit. AND they won’t give us a refund so we can be done and move on. I would NOT recommend this company.